Heat oven to 350°F (or 325°F for dark or nonstick pan). Generously grease 13x9-inch pan with shortening; lightly flour. In large bowl, beat cake mix, water, oil and eggs with electric mixer on low speed 30 seconds or until blended. Beat on medium speed 2 minutes, scraping bowl occasionally. Bake 29 to 34 minutes or until toothpick inserted in center comes out clean. Cool 15 minutes. Carefully remove cake from pan to cooling rack. Cool completely, about 45 minutes. Cover 22x12-inch piece of heavy cardboard with foil. Cut and assemble cake pieces on foil-covered cardboard as shown in diagram. Frost large marshmallow with vanilla frosting; dip in coconut. Set aside. Frost assembled cake with remaining vanilla frosting. Sprinkle red sugar on cake for top of hat; sprinkle red edible glitter on top of red sugar. Sprinkle coconut on cake for border of hat and beard. Place large coconut-coated marshmallow on top of hat for tassel. 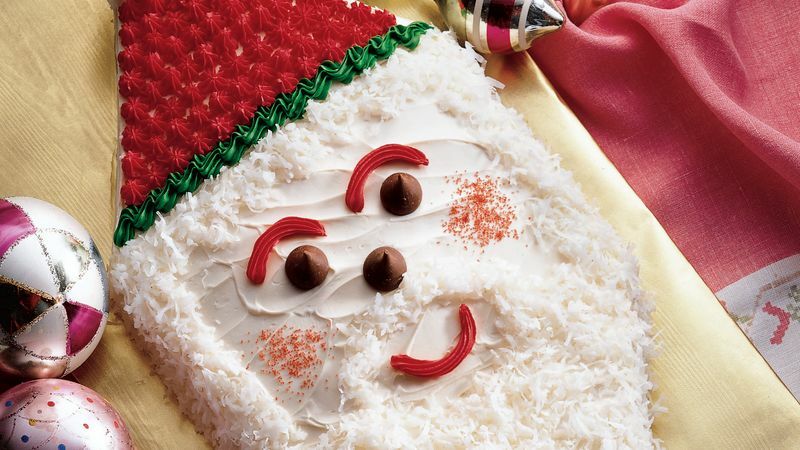 Place gumdrop halves, sugar-side-up, on cake for eyes, mini marshmallow for nose and red licorice twists for mouth. Sprinkle red sugar on cake for cheeks. Need help? Download the diagram. Express your own "Santa artistry" by using minature marshmallows instead of coconut for the hat border and beard—or try something completely different.